MapR Technologies, provider of the industry’s leading data platform for AI and Analytics, enables enterprises to inject analytics into their business processes to increase revenue, reduce costs, and mitigate risks. MapR addresses the data complexities of high-scale and mission-critical distributed processing from the cloud to the edge, IoT analytics, and container persistence. Global 2000 enterprises trust the MapR Data Platform to help them solve their most complex AI and analytics challenges. Amazon, Cisco, Google, Microsoft, SAP, and other leading businesses are all part of the MapR ecosystem. For more information, visit www.mapr.com. Google Cloud is widely recognized as a global leader in delivering a secure, open, intelligent and transformative enterprise cloud platform. Our technology is built on Google’s private network and is the product of nearly 20 years of innovation in security, network architecture, collaboration, artificial intelligence and open source software. We offer a simply engineered set of tools and unparalleled technology across Google Cloud Platform and G Suite that help bring people, insights and ideas together. Customers across more than 150 countries trust Google Cloud to modernize their computing environment for today’s digital world. IBM data science, advanced analytics and machine learning solutions enable data scientists, data engineers, and developers to infuse continuous intelligence into modern, data-driven applications. IBM has integrated popular open-source tools and libraries such as Spark, Jupyter, R, Python and Scala along with visual modeling capabilities into our extensible platform. IBM has the broadest toolset for the analytics pipeline for exploring, developing and deploying models. Please join us in booth #923 to learn more. Intel, the world leader in silicon innovation, delivers hardware and software technologies to continually advance how people work and live. Designed to deliver performance at scale, Intel technology is at the core of the digital transformation powering artificial intelligence, advanced analytics, deep learning, big data and Hadoop workloads from the edge-cloud-to the enterprise. With a range of purpose-built solutions, Intel is helping businesses of all types and sizes drive innovation in a connected world. DataScience.com empowers data scientists to deliver business-changing insights in less time with self-service access to open source tools, data and computing resources, while also improving IT’s ability to support that work. Oracle embeds Artificial Intelligence (AI) and machine learning capabilities across its software as a service (SaaS) and platform as a service (PaaS) solutions, including big data, analytics and security operations, to enable digital transformations. Together, Oracle and DataScience.com will provide customers with a single data science platform that leverages Oracle Cloud Infrastructure and Oracle’s integrated SaaS and PaaS offerings to help them realize the full potential of machine learning. Arcadia Data provides the first native visual analytics software that runs within modern data platforms for the scale, flexibility, performance, and security users need to glean meaningful and real-time business insights and design data-centric applications in the era of big data and IoT. Its flagship product, Arcadia Enterprise, is purpose-built to analyze big data without moving it to deliver self-service BI, real-time insights, and advanced analytics for use cases like cybersecurity, connected devices, and customer intelligence. Arcadia Enterprise is deployed by some of the world’s leading brands, including Procter & Gamble, HPE, Royal Bank of Canada, Kaiser Permanente, and Neustar. 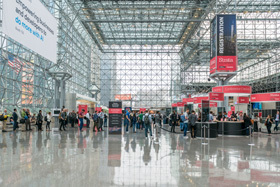 Strata Data Conference New York is the conference for data professionals and Informatica is the leader in Enterprise Cloud Data Management, helping organizations to unleash the disruptive power of data. Join Informatica to learn how to use an AI-Driven approach to access, integrate, cleanse, master, govern, and secure big data into trusted information assets. Informatica’s AI-powered Intelligent Data Platform leverages enterprise unified metadata intelligence provided by our CLAIRE™ engine, to ensure maximum developer productivity, IT agility, and business analyst autonomy in a fully secure and governed environment. Visit Informatica in booth# 829 to learn more. Kyligence is a leading data intelligence company focusing on Big Data technologies and innovation, offering intelligent platform and product built on Apache Kylin for enterprise ready business analytics solutions. The company was founded by the team who created Apache Kylin, a powerful open source OLAP engine built for interactive analytics with petabyte-scale data on Hadoop. Kyligence is the primary contributor to the open source Kylin project globally as well. Microsoft believes anyone should be able to get insights from Big Data. So, we bring the power of the cloud to Big Data making it easier than ever to work with all data types. With Microsoft data solutions, everyone can bring Big Data business insights to life through advanced analytics and stunning visualizations - all powered by our enterprise-grade, flexible and open cloud. Explore our solutions at www.microsoft.com/bigdata. Zaloni simplifies data management for transformative business insights. We work with pioneering enterprises to modernize their data architecture and operationalize their data lakes to incorporate data into everyday business practices. The Zaloni Data Platform (ZDP) provides total control throughout the data pipeline from ingestion to analytics, with comprehensive data management, governance and self-service data preparation capabilities for IT and business users. A leader in big data for more than a decade, Zaloni’s expertise is deep, spans multiple industries, and has proven invaluable to customers at many of the world’s top companies. For 12 years, Amazon Web Services has been among the world's most comprehensive and broadly adopted cloud platforms. AWS offers over 100 fully featured services for compute, storage, networking, database, analytics, application services, deployment, management, developer, mobile, the Internet of Things (IoT), artificial intelligence (AI), security, hybrid, and enterprise applications, from 54 Availability Zones (AZs) across 18 geographic regions in the United States, Australia, Brazil, Canada, China, Germany, India, Ireland, Japan, Korea, Singapore, and the United Kingdom. AWS services are trusted by millions of active customers around the world – including the fastest-growing startups, largest enterprises, and leading government agencies – to power their infrastructure, make them more agile, and lower costs. About Anaconda, Inc. With over 4.5 million users, Anaconda is the world’s most popular Python data science platform. Anaconda, Inc. continues to lead open source projects like Anaconda, NumPy and SciPy that form the foundation of modern data science. Anaconda’s flagship product, Anaconda Enterprise, allows organizations to secure, govern, scale and extend Anaconda to deliver actionable insights that drive businesses and industries forward. When extreme data requires companies to act with unprecedented agility, Kinetica powers business in motion. Kinetica is the instant insight engine for the extreme data economy. Enterprises leverage Kinetica for machine learning, deep learning, and advanced location-based analytics. Kinetica’s accelerated parallel computing brings GPUs to address the unpredictability and complexity that result from extreme data. About MicroStrategy Incorporated MicroStrategy (Nasdaq: MSTR) is a worldwide leader in enterprise analytics and mobility software. A pioneer in the BI and analytics space, MicroStrategy delivers innovative software that empowers people to make better decisions and transform the way they do business. We provide our enterprise customers with world-class software and expert services so they can deploy unique intelligence applications. To learn more, visit MicroStrategy online, and follow us on Facebook and Twitter. Pitney Bowes is a global technology company powering billions of transactions – physical and digital – in the borderless world of commerce. Leading organizations around the world rely on our software and data solutions to help them surface relevant business insights by understanding the relationships between people, places and things. At our innovative Pitney Bowes Software and Data Marketplace, customers can search our entire data portfolio, sample specific data sets and visualize data on a map. Redis Labs, home of Redis, the world’s fastest in-memory database platform, provides Redis Enterprise, as a cloud service and as a software, to over 8,000 enterprise customers. The high performance, true high availability, seamless scaling of Redis Enterprise, are top-ranked by industry analysts, power use cases such as high speed transactions, queuing, user session stores, caching, in e-commerce, personalization, IoT, fraud detection and other real-time applications. Redis, voted the most loved database, rated the #1 cloud database, #1 database on Docker, #1 NoSQL datastore, and fastest growing NoSQL database reduces application complexity, simplifies development, and provides unprecedented flexibility to developers. Talend, a leader in cloud integration, liberates data from legacy infrastructure and puts more of the right data to work for your business, faster. Talend Cloud delivers a single platform for data integration across public, private, and hybrid cloud, as well as on-premises environments, and enables greater collaboration between IT and business teams. Combined with an architecture for rapidly embracing market innovations, only with Talend can you cost-effectively meet the demands of ever-increasing data volumes and users. Over 1,500 global enterprise customers have chosen Talend to put their data to work including GE, HP Inc., and Domino’s. Actian, the hybrid data management, analytics and integration company, delivers data as a competitive advantage to thousands of customers worldwide. Through the deployment of innovative hybrid data technologies and solutions Actian ensures that business critical systems can transact and integrate at their very best – on premises, in the cloud or both. Thousands of forward-thinking organizations around the globe trust Actian to help them solve the toughest data challenges to transform how they run their businesses, today and in the future. For more, visit http://www.actian.com. Confluent, founded by the creators of Apache Kafka®, provides the leading streaming platform enabling enterprises to maximize the value of data. With a streaming platform that spans to the edges of an organization and captures data into streams of real-time events, businesses in industries such as retail, logistics, manufacturing, financial services, technology and media are able to respond in real time to every customer event, transaction, user experience and market movement whether on premises or in the cloud. Backed by Benchmark, Data Collective, Index Ventures, LinkedIn and Sequoia, Confluent is based in Palo Alto, California. To learn more, visit www.confluent.io. Databricks provides a unified analytics platform that accelerates innovation by unifying data science, engineering and business. Built by the original creators of Apache Spark™, the platform fosters collaboration on analytic workflows and provides a managed cloud infrastructure for Big Data analytics. For more information, visit www.databricks.com. DataStax powers the Right-Now Enterprise with the always-on, distributed cloud database built on Apache Cassandra™ and designed for hybrid cloud. DataStax Enterprise gives businesses full data autonomy, allowing them to retain control and strategic ownership of their most valuable asset in a hybrid cloud world. DataStax helps more than 400 of the world’s leading brands like Cisco, eBay, McDonald’s, Sony, and Walmart transform their businesses through right-now applications focused on enterprise optimization and customer experience. Dremio is a Data-as-a-Service platform that lets you get more value from your data, faster. Dremio empowers business users to curate precisely the data they need, from any data source, then accelerate analytical processing for BI tools, machine learning, data science, and SQL clients. Dremio starts to deliver value in minutes, and learns from your data and queries, making your data engineers, analysts, and data scientists more productive.​ For more information, visit www.dremio.com. GridGain is revolutionizing real-time data access and processing by offering the enterprise-grade GridGain in-memory computing platform built on Apache Ignite™. The solution is used by global enterprises in financial, ecommerce, retail, online business services, telecom, healthcare and other major sectors. GridGain solutions connect data stores (SQL, NoSQL, and Hadoop) with cloud-scale applications and enable massive data throughput and ultra-low latencies across a scalable cluster of commodity servers deployed on premise or in the cloud. The GridGain In-Memory Data Fabric offers the most comprehensive, enterprise-grade in-memory platform for high-volume transactions, real-time analytics and hybrid data processing. For more information, visit gridgain.com. Immuta is the fastest way for algorithm-driven enterprises to accelerate the development and control of machine learning and advanced analytics. The company’s hyperscale data management platform provides data scientists with rapid, personalized data access to dramatically improve the creation, deployment and auditability of machine learning and AI. Impetus is a leader in delivering transformational value to large enterprises through our products and services. We are experts in the complete Big Data ecosystem—with a current emphasis on enterprise warehouse modernization, accelerating Spark adoption in the enterprise for advanced analytics, and empowering real-time data drive decision making. For more information, visit www.impetus.com . Kyvos Insights is the world’s fastest BI on Big Data platform that delivers ad hoc analysis with instant response times at massive scale. Kyvos unlocks the power of data lakes with its patent pending technologies, serving big data insights interactively to analysts using their favorite BI tools. By creating a BI Consumption Layer, Kyvos makes big data available and secure for all users throughout the enterprise. Kyvos partners with industry leaders of BI, Cloud and Hadoop technologies. Looker is a new kind of analytics platform. From Amazon and Sony to Cigna and Lyft, more than 1,400 of today’s brightest industry-leaders rely on Looker to drive their business forward. Looker allows everyone to easily access, analyze and share the fresh data needed to make informed decisions, from a single source of truth. Now anyone can create custom dashboards and beautiful, dynamic charts to inform and enable teams to keep asking. So, say goodbye to data chaos. The data bottleneck is dead. Data is changing the way we work today. Looker is changing the way we work with data. StreamSets transforms how enterprises flow big and fast data from myriad sources into data centers and cloud analytics platforms. Its DataOps platform helps companies build and operate continuous dataflow topologies, combining award-winning open source data movement software with a cloud-native Control Hub. Enterprises use StreamSets to enable cloud analytics, data lakes, Apache Kafka,, IoT and cybersecurity. Founded by Girish Pancha, former chief product officer of Informatica, and Arvind Prabhakar, a former engineering leader at Cloudera, StreamSets is backed by top-tier Silicon Valley venture capital firms, including Battery Ventures, New Enterprise Associates (NEA), and Accel Partners. For more information, visit www.streamsets.com. Continuous, real-time data movement and processing to Cloud, Hadoop and Kafka/Kudu environments. Striim offers real-time data ingestion and Change Data Capture (CDC) across a wide variety of data sources including enterprise databases, log files, message queues (Kafka), and IoT sensor data. With Striim, enterprises can perform in-stream transformations, filtering, aggregations and enrichment of data in order to detect anomalies, and trigger alerts and workflows. This all happens in-memory, before the processed data is loaded to a wide variety of Cloud (Azure, Google Cloud, AWS) and on-prem targets. For more information, visit www.striim.com, read our blog at www.striim.com/blog/, or follow @striimteam. We help clients design, build, and run insight-driven organizations by helping to maximize the potential value of analytics and information to deliver operational excellence, new products and services, competitive agility, and growth. Our analytics and information management services offer an integrated approach with our broad range of solution offerings, including: shaping strategy, managing data, delivering information, improving performance, optimizing insights, amplifying intelligence, building capabilities, and managing complex digital environments. NVIDIA is a computer technology company that has pioneered GPU-accelerated computing. It targets the world’s most demanding users — gamers, designers and scientists — with products, services and software that power amazing experiences in virtual reality, artificial intelligence, professional visualization and autonomous cars. Accenture is a leading global professional services company, providing a broad range of services and solutions in strategy, consulting, digital, technology and operations. Combining unmatched experience and specialized skills across more than 40 industries and all business functions—underpinned by the world’s largest delivery network—Accenture works at the intersection of business and technology to help clients improve their performance and create sustainable value for their stakeholders. With approximately 442,000 people serving clients in more than 120 countries, Accenture drives innovation to improve the way the world works and lives. Visit us at www.accenture.com. Alation is the first data catalog built for collaboration. With Alation, analysts are empowered to search, query and collaborate on their data to achieve faster, more accurate insights. Alation automatically captures the rich context of enterprise data, including what the data describes, who has used it, and the fit between the data and different types of analysis. Alation’s catalog is generated and updated using machine learning and improved through human collaboration between analysts, stewards, and business users. Alation is funded by Andreessen Horowitz, Bloomberg Beta, Costanoa Venture Capital, Data Collective and General Catalyst Partners. Customers include eBay, Citrix, and Safeway. Algorithmia's goal is to make applications smarter by building a community around building smarter applications. As developers, we want to advance the development, discovery, and accessibility of algorithmic intelligence. That's why we're building the largest marketplace for algorithms in the world available through a simple, scalable API. Today more than 50,000 developers have access to a growing library of 2,500 algorithmic microservices. Our team is dedicated to reaching developers on every corner of the earth, we hope you consider joining us. Alluxio, Inc. was founded by the creators and top contributors of the open source Alluxio project -- the first memory speed virtual distributed storage system. Alluxio's memory-centric architecture provides orders of magnitudes performance gains and superior manageability by allowing developers to interact with a single storage layer API. Alluxio, Inc. is venture-backed by Andreessen Horowitz. For more information, contact info@alluxio.com. Alteryx, Inc. is a rapidly growing leader in data cataloging, preparation, advanced analytics and modeling that is breaking the barriers across the analytics process - empowering hundreds of analysts within a single enterprise to become “citizen data scientists,” and even helping data scientists get to the answer faster. The Alteryx platform provides users with a code-free and code-friendly workflow that leads to impactful business outcomes, saving weeks of mundane prep, resulting in them truly loving their jobs again. This is how customers describe how they feel when experiencing Alteryx. Over 2,800 companies across leading brands worldwide rely on Alteryx daily. Anodot applies AI to deliver autonomous analytics in real-time, across all data types, at enterprise scale. Unlike the manual limitations of traditional BI, we provide analysts mastery over their business with a self-service AI platform that runs continuously to eliminate blind spots, alert critical issues and investigate root causes. Anodot has nearly 100 customers in digital transformation industries like eCommerce, FinTech, AdTech, Telco, Gaming, including Microsoft, Lyft, Waze, Pandora, Appnexus, Wix and King. Anodot is headquartered in Silicon Valley and Israel, with Sales offices worldwide. Ataccama delivers smart and collaborative data curation solutions. As increasingly more businesses undergo digital transformation, our goal is to provide clients with the ONE platform they need to analyze, process, manage, monitor, and provide their data. Ataccama ONE is a powerful data curation platform with a business friendly interface, intended for any data, domain, user, and deployment (Hadoop/Spark/On-Prem/Cloud). It integrates Data Profiling & Catalog, Data Quality & Governance, and Master Data Management. Try our free, collaborative ONE-click data profiler powered by Ataccama ONE at one.ataccama.com. Attunity is a leading provider of real-time data integration and data management software solutions that enable availability, delivery, and management of data across organizations and heterogeneous enterprise platforms, including databases, data warehouses, streaming platforms, Hadoop and the cloud. More information can be found at: www.attunity.com. Beyond Limits is a pioneering Artificial Intelligence company with a technology history in Space Exploration. Beyond Limits provides advanced intelligence solutions that go far beyond conventional AI. Our cognitive computing technology mimics human thought processes and provides autonomous reasoning to aid human-like decision-making. BigID aims to transform how enterprise protect and manage the privacy of personal data. Organizations are facing record breaches of personal information and proliferating global privacy regulations like the EU GDPR with fines reaching 4% of annual revenue. Today enterprises lack dedicated purpose built technology to help them track and govern their customer data at scale. By bringing data science to data privacy, BigID aims to give enterprises the software to safeguard and steward the most important asset organizations manage: their customer data. BlueTalon is a leading provider of data-centric security for big data, data lakes, and new data initiatives. The BlueTalon Policy Engine delivers precise, consistent, and dynamic user access controls to data across Hadoop, Spark, and SQL-based data platforms. The BlueTalon Audit Engine provides a full audit trail at the level of detail required for compliance to regulations: user and data. Fortune 100 have deployed BlueTalon to eliminate security blind spots and gain visibility and control at the data layer across cloud-base and on-premises environments. BlueTalon was named a 2016 Gartner cool vendor and won numerous security and big data awards. Cambridge Semantics (CSI), the Smart Data Company, is an enterprise analytics and data management company. It enables customers and partners to rapidly build interactive, real-time smart data solutions based on its graph Anzo Smart Data Platform (Anzo SDP). IT departments and business users gain better understanding and data value through the semantic linking, analysis and management of diverse data whether internal or external, structured or unstructured. The Anzo SDP smart data solutions are delivered with increased speed, at big data scale and at the fraction of the implementation costs of using traditional approaches. The company is based in Boston, Massachusetts. CData Software (www.cdata.com) is a leading provider of data access and connectivity solutions. Our mission is to simplify the way that users and applications connect with data. We specialize in the development of Drivers and data access technologies for real-time access to online or on-premise applications, databases, and SaaS APIs. data Artisans was founded by the creators of open source Apache Flink® to bring real-time data applications to the enterprise. data Artisans Platform, provides turnkey stream processing to businesses, enabling them to manage and deploy live data applications so they can react to data instantaneously and make better and faster business decisions. Global companies such as Alibaba, ING, Netflix and Uber use Flink as the stream processing engine to power large-scale stateful applications, including real-time analytics, machine learning, search and content ranking, and fraud detection. data Artisans is based in San Francisco, CA and Berlin. For more information, visit https://data-artisans.com. DataCamp is a leading online learning platform in the data science field. Our mission is to democratize data science education by building the best platform to learn and teach data skills and make data fluency accessible to millions of people and businesses around the world. DataFactZ is a Business Analytics company. We help large enterprises manage and leverage data with a suite of services in Data Engineering, Data Science, and Decision Science. Our experts enable Executives to harness the power of Big Data and Advanced Analytics to become truly Data Driven. Whether you’re new to this space and don’t know where to start, or highly mature and need help delivering complex machine learning or predictive models, DataFactZ can help. Our experience and passion for both technology and analytics enable us to develop solutions for our clients that change business problems into competitive advantage. Dataiku develops the unique advanced analytics software solution that enables companies to build and deliver their own data products more efficiently. Thanks to a collaborative and team-based user interface for data scientists and beginner analysts, to a unified framework for both development and deployment of data projects, and to immediate access to all the features and tools required to design data products from scratch, customers such as AXA, L’Oreal, Bechtel, Webbmason, Urban Insights, and many more easily apply machine learning and data science techniques to all types, sizes, and formats of raw data to build and deploy predictive data flows. DataRobot offers an enterprise machine learning platform that empowers users of all skill levels to make better predictions faster. Incorporating a library of hundreds of the most powerful open source machine learning algorithms, the DataRobot platform automates, trains, and evaluates predictive models in parallel, delivering more accurate predictions at scale. DataRobot provides the fastest path to data science success for organizations of all sizes. For more information, visit datarobot.com. Datatron provides a continuous model life cycle management platform, which facilitates productionizing machine-learning (ML) and deep-learning (DL) models. We automate ML and DL model deployment, testing, monitoring, debugging, versioning, and management at scale, in production, to increase the efficiency of your data scientists and engineering and dev ops teams. We uniquely support A/B testing, challenger models, and online learning, allowing faster model-to-production iteration. Digital Asset is the leading provider of Distributed Ledger Technology to regulated financial institutions. diwo is a unique cognitive decision-making platform developed by Loven Systems that reveals hidden business opportunities in real-time and empowers business users to act on them. More than a continuous business optimization engine identifying and quantifying time-sensitive business scenarios, its intuitive interface offers guidance by providing flexible strategies to act on those opportunities. With its advanced artificial intelligence capabilities, diwo guides the user through natural conversation and allows decision-makers to explore by tweaking certain decision levers to see impact in real-time. diwo ushers in a new paradigm of opportunity-driven enterprise, one that enables entire organizations to shape their future today. Domino Data Lab provides an open data science platform to help companies run their business on models. Model-driven companies like Allstate, Instacart, Dell, and Monsanto use Domino to accelerate breakthrough research, increase collaboration, and rapidly deliver high-impact models. Founded in 2013 and based in San Francisco, Domino is backed by Sequoia Capital, Bloomberg Beta, and Zetta Venture Partners. To learn more, visit dominodatalab.com. Dow Jones brings together world-leading data, membership, media and intelligence solutions supporting professionals in tackling their business challenges. Dow Jones DNA Platform powers enterprise workflow and analytics with news derived data. The platform aggregates content from Dow Jones publications and premium, licensed third-party sources all tagged with our patented taxonomy, Dow Jones Intelligent Identifiers. All of DNA’s content is machine-readable, and therefore can be directly integrated with in-house applications for rapid ingestion and interpretation of multiple streams of data. Content from the DNA Platform supports four key integration capabilities; Text Mining/ML, Data Augmentation, Data Integration and App Development. As a pioneer in online education, Drexel University began offering online courses in 1996. Drexel currently offers over 140 online degree and certificate programs including graduate degrees in data science and business analytics. To learn more, visit us at Drexel.edu/online. Equalum is the leading Data Beaming platform, relied upon by enterprises across industries to seamlessly teleport operational data to real-time analytics environments. Built for scalability and ease of use, Equalum’s Data Beaming platform ingests data in real-time, as it is created, from any number of data sources. Equalum processes and transforms the data before streaming it to any number of target applications or systems. Data Beaming technology harnesses the power of Spark in an end-to-end, enterprise-grade solution – helping organizations rapidly accelerate past traditional ETL or open-source implementations with a zero-coding approach, intuitive design, and minimal maintenance. FirstEigen, Gartner Cool Vendor 2017, eliminates Data Quality validation and Data Matching problems and makes data useable. The tool DataBuck, powered by Machine Learning algorithms, autonomously learns data’s expected behavior and applies 1000’s of data validation checks without needing coding. It eliminates anticipated and unanticipated data quality errors which accumulate over time and as data moves between systems. Built on Spark with specialized algorithms, it delivers 10x speed over any other tool. Errors can be identified autonomously from multiple data sets in 3 Clicks. DataBuck is compatible with all major platforms (SQL/no-SQL/Hadoop/Cloud) and can handle both regular and Big Data. FORMCEPT, founded in 2011 by ex Oracle, IBM employees, is a product company that is into Cognitive Intelligence, Big Data Analytics, AI/,IoT space. We provide near real-time actionable insights to enterprises based on the data provided (be it unstructured/ Semi-structured / poly-structured) and deliver end to end analytics solutions. Over the last few years, we have served Fortune 1000 clients across sectors like Sports, BFSI, Retail, Startups etc. We have presence in US, Menlo Park, CA and in Bangalore, India. We have also received awards from Front & Sullivan, NASSCOM, TiE50 and IIM Ahmedabad. GigaSpaces provides the leading in-memory computing platform for fast-data analytics, AI and extreme transaction processing. With GigaSpaces InsightEdge Platform, and its core engine XAP, organizations can overcome the complex obstacles of big data and advanced analytics to deliver real-time business impact. GigaSpaces offices are located in the US, Europe and Asia. We are a digitally native company that leverages the latest digital and cognitive technologies and methodologies to transform organizations in every aspect. We help our customers emotionally connect with their customers and employees, and improve their efficiency. We are the place where engineering, innovation, and design meet at scale. GSPANN is a digital experience and analytics consultancy focused on providing turn key implementations for our customers. GSPANN provides Big Data analytics across all major cloud platforms viz., GCP, Azure and AWS. GSPANN’s customers are spread across Fortune 500 to startups. GSPANN provides an engagement experience, unlike others, by combining the intimacy of a boutique consultancy with the scale of a large firm to provide clients with a refreshing approach to solution delivery. GSPANN has built in-house products to move and govern data into big data cloud from legacy EDWs, saving companies time and effort in building their data lakes. H2O.ai is the leader in AI with its visionary open source platform, H2O. Its mission is to democratize AI for all. Gartner named H2O.ai as a Leader in the 2018 Magic Quadrant for Data Science and Machine Learning Platforms. More than 14,000 companies use open-source H2O in mission-critical use cases for Finance, Insurance, Healthcare, Retail, Telco, Sales, and Marketing. H2O.ai recently launched Driverless AI that uses AI to do AI in order to provide an easier, faster and cheaper means of implementing data science. The Iguazio Continuous Data Platform digitally transforms businesses by analyzing data from a variety of sources and types to create actionable insights. Through its platform, Iguazio simplifies the development and deployment of high-volume, real-time, data-driven applications to extend the cloud experience to the edge and on-premises environments. Iguazio accelerates the digital transformation of manufacturing, healthcare, financial services and others by supporting rapid development of applications for the Internet of Things, autonomous systems, media, cybersecurity and smart mobility. The company was founded in 2014 and has offices in the USA, UK, Singapore and Israel. Imanis Data is the leading provider of Big Data orchestration, mobility, and protection for NoSQL and Hadoop. Its machine learning platform enables customers to fully monetize and secure their Big Data assets while improving both product development and quality. Its software optimizes storage tiering, disaster recovery, streamlines cloud migration, compliance and rapidly identifies security threats such as Ransomware attacks. Imanis Data’s customers include leading Fortune 500 businesses in the retail, financial services and technology industries, among others. Imanis Data is located in San Jose, CA. For more information, visit www.imanisdata.com. Utilizing the industry’s first Direct Data Mapping engine, Incorta aggregates large, complex business data in real time, eliminating the need to reshape your data. By keeping data in its original form, Incorta accelerates the time required to roll out new analytic applications from months to days, and reduces query and reporting times from hours to seconds. With Google-like search and direct integration with Excel, Tableau, and other visualization tools, Incorta allows business users to easily, securely tap into their enterprise data with a single, complete self-service analytics platform. Indexima is creating momentum for Data Driven companies aiming for Zero Time to Data. Indexima enables business analysts to access immediately their company’s data using the most popular analytics solutions. The Indexima Data Hub relies on new age technologies combining Artificial Intelligence and disruptive indexation for an immediate response to analytical queries regardless of data volume. InsightFinder provides innovative machine learning technology to unlock the value in IT operational data, from performance metrics to textual log files, finding root causes for deviations from normal behaviors and recurring patters, as well as predicting future events, outages, and breaches. InsightFinder's core technologies and patent-pending solutions are available via online subscription or on-premises deployment. Effective management of your customers’ personal information goes beyond the new EU law, the General Data Protection Regulation (GDPR), and includes all business obligations such as, contracts, privacy statements and consent, in addition to regulations. Integris turns those obligations into machine readable format and applies them to a live, dynamically created map of your data, regardless of whether your data is on premise, in the cloud, structured or unstructured. This gives you an automated and auditable system of record for all your obligations, including GDPR, allowing you to manage your corporate risk. Io-Tahoe is a pioneer in machine learning-driven smart data discovery products enabling organizations to discover data across a wide range of heterogeneous technology platforms, from traditional databases and data warehouses to data lakes and other modern repositories. The product utilizes machine learning algorithms to dramatically increase the accuracy, intelligence and speed of learning of complex data elements and data relationships throughout the business environment. Our product is particularly valuable to businesses with large numbers of customers and diverse data sets, such as those in the financial services, utilities, retail, transportation, insurance, healthcare and manufacturing industries. Kogni is a leading data security product in the Big Data space with presence in North America and Asia. Kogni discovers sensitive data in enterprise data sources, secures it, and continuously monitors for new sensitive data. Kogni helps organizations comply with regulations such as GDPR, PCI, HIPAA, PHI, FERPA, and others. Kogni specializes in data security and helps enterprises move beyond perimeter security. Kogni’s approach to data security reduces the impact of a data breach, helps enterprises comply with regulations, and enables data governance initiatives by monitoring for policy violations. Lightbend provides tools for Reactive, Fast Data pipelines: Spark for analytics, Akka for distributed middleware and event streams, Lagom for microservices, Play for web services, and Scala, the implementation language for today's Fast Data tools. Lore IO is a big data management platform provider that unifies on-demand, real-time business knowledge. We connect data analysts and business users directly to their valuable data -- wherever the data lives, whatever it looks like, and however much it changes -- by removing the expensive and cumbersome plumbing of big-data analytics. Headquartered in Sunnyvale, CA, Lore IO was founded by veterans of WalmartLabs, and battle-hardened in highly performant transaction environments. Our platform launched in 2016 and is now used by medium and large companies across countries and industries. MapD is a next generation analytics platform. Business and government organizations use MapD to rapidly find insights beyond the limitations of mainstream analytics tools. Because MapD delivers zero-latency querying and visual exploration of very large datasets, analysts and data scientists can dramatically accelerate operational analytics; data science; and geospatial analytics. Originating from research at MIT, MapD represents a technology breakthrough by harnessing the massive parallel computing of GPUs. MapD Technologies Inc. is headquartered in San Francisco. Memgraph provides the world’s first real-time transactional graph database. Built from the ground up by blending the latest in high-performance data structures and in-memory primary storage, Memgraph delivers record-breaking performance on terabytes of deeply interconnected data on commodity hardware. Businesses of all types and sizes use Memgraph to store, analyze and visualize data within milliseconds to extract as much value as possible and build the next generation of world-changing applications driven by connected data. Metis Machine’s Skafos is the world’s first machine learning continuous deployment and monitoring platform built exclusively for delivering AI/ML to enterprise-scale production. Using an auto-scaling microservices architecture, Skafos lowers the total cost of ownership by replacing the time consuming task of building and managing pipeline infrastructure, removing more work from your already resource constrained DevOps teams. Our users witness 95% faster time to market using the tools and workflows they already love. You build, we ship. Okera is the first software provider to enable the management of data access and governance at scale for today’s modern heterogeneous data environments. Okera’s Active Data Access Platform allows agility and governance to co-exist and gives data producers, consumers and stewards the confidence to unlock the power of their data for innovation and growth. This unique, enterprise-wide platform facilitates the provisioning, accessing, governing and auditing of data in today’s multi-cloud, multi-data-format, and multi-tool world. Oracle Cloud Infrastructure is an Enterprise Cloud equally capable of running traditional multi-tiered enterprise applications, high-performance workloads, and modern serverless and container-based architectures. Oracle Cloud Infrastructure’s Partners in the Big Data & Analytics ISV ecosystem are helping enterprises harness the power of data to make what’s impossible today possible tomorrow. Pepperdata brings total performance management, the combination of application performance management (APM) and Operations Performance Management (OPM), together in a single package so developers and operators can build and operate highly performant big data applications in multi-tenant clusters. For developers, the Application Spotlight self-service application performance management (APM) portal provides recommendations and insights to optimize applications and find the root cause of bottlenecks and failures. Platform Spotlight makes it easy for Operators to identify applications and users causing issues on the platform, proactively alert on those issues, and improve cluster performance. phData’s service includes people and automation to drive value from data science, machine learning, interactive analytics, and real-time serving applications. phData’s pioneering Platform COE Managed Service enables customers to adopt and support Big Data and Cloud platforms. Powered by differentiated tooling and IP, the Platform COE picks up where others leave off, providing “as-a-service” operations, monitoring, tuning, guidance, architecture, and strategy for your cloud-native and Big Data platforms. phData DataOps helps companies author, deploy, and support your data pipelines faster, more reliably, with fewer errors. Podium is a modern big data management solution that revolutionizes how IT and data delivery teams onboard, catalog, prepare, and deliver business-ready data to data consumers across the enterprise. It transforms your traditional data supply chain into a self-service, on-demand marketplace. This revolutionary approach accelerates delivery by more than twenty-five times while reducing costs by 40 percent. A growing list of Fortune 1000 enterprises is already using the Podium Data Marketplace to deliver a wide range of analytics projects like never before. More information is available at www.podiumdata.com and on Twitter at @PodiumData. Privitar helps organisations engineer privacy-preserving data operations, using advanced data privacy techniques that protect sensitive information while retaining data utility. Privitar's software accelerates and automates privacy-safe data provisioning, helping their customers get more business value from their datasets, generate data-driven insights, and drive innovation. For technology powered visionaries with a passion for challenging the status quo, PSSC Labs is the answer for hand-crafted Big Data computing solutions that deliver relentless performance with the absolute lowest total cost of ownership. For over 25 years we have dedicated ourselves to delivering the absolute highest quality computing solutions to the world’s most demanding organizations. While other companies talk a good game, we actually deliver. For more information please visit www.pssclabs.com. Pure Storage accelerates possible, transforming businesses in ways previously unimagined. The company’s disruptive, software-driven, all-flash storage technology combined with a customer-friendly business model drives business and IT transformation for customers through dramatic increases in performance and efficiency at lower costs. With Pure's industry leading Net Promoter Score score of 83.7, Pure customers are some of the happiest in the world, and include large and mid-size organizations across a range of industries. With Pure Storage, companies push the boundaries of what's possible to become faster, smarter and more innovative. Qubole is revolutionizing the way companies put data to work across their organizations. With Qubole’s cloud-native Big Data Activation Platform, companies exponentially activate petabytes of data faster, for everyone, while lowering costs. Forward-thinking data teams choose Qubole to power their Big Data Activation strategy, activating an infinite volume and variety of data across the business. Customers achieve the lowest TCO: intelligent automation and self-service supercharge productivity, while workload-aware auto-scaling and real-time spot buying drive down compute costs. Qubole offers the only platform that delivers freedom of choice – use any engine, any tool, any cloud to match your company’s needs. QuerySurge is the leading Data Testing solution, built to automate the validation & testing of Data Warehouses, Big Data, and BI Reports. QuerySurge ensures that data extracted from data sources remains intact in the target data store by analyzing and pinpointing any differences quickly. The main use cases include Data Warehouse/ETL testing, Big Data testing, Data Migration testing, BI Report testing, and Enterprise Application/ERP testing. Test across different platforms, including data warehouses, Hadoop, NoSQL datastores, databases, flat files, XML, JSON, & web services. Our solution improves data quality, while reducing costs & risks. QuerySurge is the software division of RTTS. Veera, the innovative analytics software platform by Rapid Insight, enables any institution to create a truly data-driven culture. Veera simplifies the process of connecting to data sources, cleansing and preparing data, performing on-demand or scheduled analyses, building predictive models, sharing reports and empowering employees across the enterprise with the ability to manipulate and explore data. Affordable and easy to use, Veera is a powerful platform that enables exploration, drives curiosity, and makes critical business insights more accessible than ever before. Red Hat is the world's leading provider of open source solutions, taking a community-powered approach to provide reliable and high-performing cloud, virtualization, storage, Linux, and middleware technologies. Red Hat also offers award-winning support, training, and consulting services. And as the connective hub in a global network of enterprises, partners, and open source communities, Red Hat enables the creation of relevant, innovative technologies that liberate resources for growth and prepare customers for the future of IT. Red Hat is an S&P company with more than 70 offices spanning the globe, empowering our customers' businesses. Previous generations envisioned a future in which technology ubiquitously serves our needs as we ceaselessly conquer the frontiers of space and knowledge. The Ricker Lyman Robotic Company is dedicated to that vision. Strata Data NY 2018 marks the debut of our first product, Hivecell One: while software has undergone a distribution revolution, hardware has not... until now. A small, stackable server with 6 CPU cores, 256 GPU CUDA cores and 8 GB RAM, Hivecell One is the answer to the distributed development quandry. Just stack it for true linear scalability, with no additional wires, thanks to our patent-pending Baranovsky connectors. RStudio offers open source and enterprise ready professional software for R. Our flagship product is an Integrated Development Environment (IDE) which makes it easy for analysts, scientists, data scientists and quants to perform their analyses. We also offer a web application framework called Shiny that allows you to take those analyses and share them with your team/organization by creating interactive web applications. The RStudio team also contributes code to many R packages and projects. R Markdown, ggvis, dplyr, knitr, and packrat are R packages from RStudio that enhance the value, reproducibility, and appearance of the work of data scientists. Rubrik Datos IO gives forward-thinking technologists the speed of NoSQL and the peace of mind of proven backup and recovery. We build software to make your unstructured, NoSQL databases safer, whether in your data center, your hybrid cloud, or the public cloud. Magnitude Software’s Simba Connectivity solutions are the global benchmark for standards-based data access and analytics needs. Our data connectivity solutions support multiple standards, including ODBC, JDBC, MDX, OLE DB, OLAP, ODBO, XMLA, and ADO.NET, with Windows, Mac, UNIX, Linux and mobile device platform support.Our reputation as a relational and multi-dimensional / MDX connectivity pioneer has made us the partner of choice for the world’s most dynamic software companies. SnapLogic is the leader in self-service integration. The company’s Enterprise Integration Cloud makes it fast and easy to connect applications, data, APIs, and things. The company recently introduced SnapLogic eXtreme, a new solution to help organizations operationalize cloud-based big data integrations. Customers including Adobe, AstraZeneca, Box, GameStop, Verizon, and Wendy’s rely on SnapLogic to automate business processes, accelerate analytics, and drive digital transformation. SnapLogic was founded by data industry veteran Gaurav Dhillon and is backed by blue-chip investors including Andreessen Horowitz, Capital One, Ignition Partners, Microsoft, Triangle Peak Partners, and Vitruvian Partners. Learn more at snaplogic.com. Split is the leading platform for feature experimentation, empowering businesses of all sizes to make smarter product decisions. Companies like Salesforce, Vevo, and Twilio, rely on Split to securely release new features, target them to customers, and measure the impact of features on their customer experience metrics. Founded in 2015, Split's team comes from some of the most innovative enterprises in Silicon Valley, including Google, LinkedIn, Salesforce and Databricks. Split is based in Redwood City, California and backed by Lightspeed Venture Partners, Accel Partners, and Harmony Partners. To learn more about Split, contact hello@split.io. Streamlio helps organizations connect, process, and store streaming data to power data-driven applications with a unified solution for handling fast-moving data. Created by experts in data processing, Streamlio brings together proven, scalable technology for messaging, processing, and storage of streaming data. The Streamlio solution is designed for applications that need to handle fast-moving data with high performance, low latency, and guaranteed data durability. Tamr unifies and enriches the vast reserves of underutilized internal and external data, so enterprises can use all their data for analytics and downstream applications. Tamr's data-unification platform combines machine learning algorithms with collective human insight to identify sources, understand relationships and curate the massive variety of disconnected data. The Tamr platform is deployed in production at information services providers, pharmaceutical firms, retailers and other customers. tazi.ai is an online and scalable machine learning product company. Our solutions are based on an architecture that combines 30+ years of experience and 17 patents granted in AI and ML models that explains their reasoning and learns continuously from streaming data sources and human experts.Tazi.ai supports rare event and pattern detection, prediction, online recommendations and prescriptions. Through its understandable continuous machine learning from data and humans, tazi.ai supports banking, insurance, retail, telco, healthcare and IoT industries in making smarter, more intelligent business decisions. Some unique features: learns from data and humans, hyperparameter optimization, explainable models, heterogeneous data support. TigerGraph is the world’s fastest graph analytics platform designed to unleash the power of interconnected data for deeper insights and better outcomes. TigerGraph fulfills the true promise and benefits of the graph platform by tackling the toughest data challenges in real time, no matter how large or complex the dataset. TigerGraph supports applications such as IoT, AI and machine learning to make sense of ever-changing big data. TigerGraph’s proven technology is used by customers including Uber, VISA, Alipay, Wish, China Mobile, State Grid Corporation of China, and Elementum. For more information, follow the company on Twitter @TigerGraphDB or visit www.tigergraph.com. TimescaleDB is the only open-source time-series database that natively supports full-SQL at scale, combining the power, reliability, and ease-of-use of a relational database with the scalability typically seen in NoSQL databases. It is packaged as a PostgreSQL extension and optimized for fast ingest and complex queries. TimescaleDB is deployed for powering mission-critical applications, including industrial data analysis, complex monitoring systems, operational data warehousing, financial risk management, and geospatial asset tracking across industries as varied as manufacturing, utilities, oil & gas, logistics, mining, smart spaces, ad tech, finance, telecom, and more. Timescale is backed by NEA, Benchmark, and Two Sigma Ventures. Trifacta is the industry pioneer and established leader of the global market for data preparation technology. The company draws on decades of academic research to make the process of preparing data faster and more intuitive. More than 50,000 Data Wranglers in 10,000 companies worldwide use Trifacta solutions across cloud, hybrid and on-premises environments. Leading organizations such as Deutsche Boerse, Google, Kaiser Permanente, New York Life and PepsiCo count on Trifacta to accelerate time-to-insight and discover opportunities that drive success. Learn more at trifacta.com. WANdisco is shaping the future of data infrastructure with its groundbreaking LiveData platform, enabling companies to finally put all their data to work for the business – all the time, at any scale. Only WANdisco makes data always available, accurate, and protected. With our unique, patented technology, WANdisco operationalizes LiveData ensuring that all resources are fully leveraged to run your business. With significant OEM relationships with IBM and Dell EMC and go-to-market partnerships with Amazon Web Services, Cisco, Microsoft Azure, Google Cloud, Hewlett Packard Enterprise, Oracle and other industry titans. WANdisco is igniting a LiveData movement worldwide. Waterline’s Smart Data Catalog uses machine learning to discover, manage and govern enterprise data at scale. Chief Data Officers, Architects, Analysts and Data Stewards use Waterline to enable self-service analytics, data governance and data rationalization/optimization. By connecting the right people to the right data, Waterline Data makes big data easier to find and use. Best known for Mathematica and Wolfram|Alpha, Wolfram Research has been pioneering computation and scientific innovation for three decades. Our growing family of innovative cloud and desktop products are all built on the Wolfram Language, a robust programming language with a vast web of algorithms for AI, data science, finance and more—not to mention the built-in knowledge of Wolfram|Alpha, expert-contributed cloud resources like the Wolfram Data Repository and the Wolfram Neural Net Repository, and a range of deployment options. Learn more at www.wolfram.com. ZEPL is the commercial application of Apache Zeppelin that takes Zeppelin’s core notebook technology and applies enterprise security, authentication, and governance in the cloud to provide an enterprise-ready collaborative data science solution. Designed to support Big Data, Zoomdata's Stream Processing technology delivers real time data feeds to tablet and browser based devices. Through the use of touch screen devices, users are able to interact with data in real time, rewind the data, compare the data and share views with their colleagues. AlternativeData.org is the largest community of institutional investors and data providers in the alternative data industry. Ramp-up and stay informed on alternative data with the latest datasets, jobs, news, tools, and events. Welcome to The Big Data Beard podcast, where we explore the trends, technology, and talented people making Big Data a big deal. Boundless Notions: We help businesses design applications and infrastructure that will let them focus on what they do best. The Data Incubator is an intensive 8 week fellowship that prepares the best scientists and engineers with advanced degrees to work as data scientists and quants. It identifies Fellows who already have the 90% difficult-to-learn skills and equips them with the last 10%: the tools and technology stack that make them self-sufficient, productive contributors. The program is free for Fellows. Employers only pay a tuition fee if they successfully hire. Fellows have the option to participate in the program either in person in NYC, Washington DC, San Francisco Bay Area, or online. Data Science Central is the industry's online resource for Big Data Practitioners / Data Scientists. From Analytics to Data Integration to Visualization, Data Science Central provides a community experience that includes a robust editorial platform, social interaction, forum-based technical support, the latest in technology, tools and trends and industry job opportunities. For general questions/comments and advertising/sponsorship opportunities please email: info@datasciencecentral.com. Quantopian, is a crowd-sourced hedge fund that offers an algorithmic trading platform for the quantitative trading community to build, test, and execute trading algorithms. Live trading algorithms are eligible become part of our crowd-sourced hedge fund - where top quant talent is matched with outside investor capital. Quantopian's mission is to attract the world’s best algorithmic and financial talent, including talent that hasn’t yet had the opportunity to be a quant. We want to bring this talent together, provide them with the tools that they require, and help them build a community. RTInsights is an independent, expert-driven web resource that sheds light on the business impact of real-time analytics, the Internet of Things and cognitive computing. We help our readers, which include business and IT professionals across almost every industry, understand the value of fast, actionable data and unravel an array of approaches, vendors, and solutions. By working with RTInsights, our partners stay connected and improve their product marketing, lead generation, and thought leadership activity. The Daily Threat Brief is an open source intelligence report modeled after the concept of the President’s Daily Brief (PDB). Online calendar and database of major tech events all over the world. For exhibition and sponsorship opportunities at Strata Data Conference, email strataconf@oreilly.com.